Raglan Sleeves -Trivia which make a difference. Raglan sleeves are very popular in knitting. Especially a top-down raglan - a flexible design with absolutely no seaming and pattern. It has limitless opportunities for variations: pullover or cardigan; loose or fitted; short-sleeved, long-sleeved, 3/4, no sleeves; any type of the neck line. 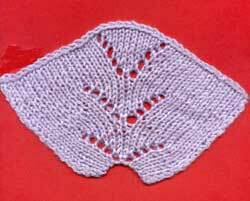 The most popular way of knitting raglan designs is using circular needles. There is one thing about circularly knit garment you should be aware of. If you look at the pattern of a seamless sweater on the left below you will notice that a neck line is not a circle, but an oval. It means that a neck line is lower in the front and higher in the back. Usually difference between them is 2-4 in for adult garments and 1-2 in for kids. If you care about fitting the neck, you shouldn't follow any top-down raglan descriptions which invite you to begin make increases along the raglan lines RIGHT after you caste on the stitches for the neck line. Why? Because the result will be pretty bad. A neck line of a sweater will try to climb your chin all the time. Not too nice, believe me. What is the solution? 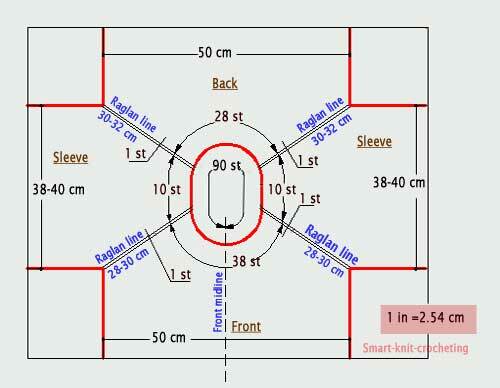 The neck line of a garment with raglan sleeves should be shaped properly. To make it lower in the front and higher in the back, one should knit SHORT ROWS to form a neck line BEFORE you join all stitches in a circle and start to make increases . 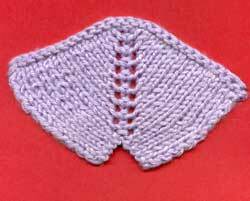 A detailed explanation about doing short rows can be found on the Seamless Sweater page. Perhaps you can knit your garment with raglan sleeves not doing those SHORT ROWS, to form a well fitting neck line. "Hey, it is knitwear! It will be pulled once you start to wear it and everything will fit fine!" Sorry, it will not. You can not deceive geometry and your body measurements. But certainly it depends upon your requirements to quality of your work. So... the choice is yours. Very often neat stitches and accurately executed elements of a garment do MUCH MORE for your knitting than any intricate pattern. Short rows are one of those "insidious" elements. Another one is a raglan line. Those diagonal lines which run from the underarm to the neck edge, have the ability to "catch an eye" sooner that anything else. Hence, they have to look decent. There are a couple choices here. Either design them as little noticeable as possible or let them attract attention as decorative elements. Wrong Side Rows are not shown on the chart. Remember to work them! 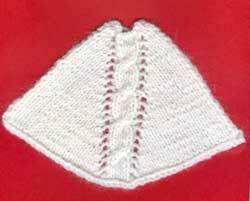 To make a raglan line increases with no holes, check the Twisted Stitch page.